Whether you’re a cooking newbie or a seasoned slicer, a sharp blade will instantly improve your knife skills, making faster, easier and more uniform work of everything that crosses your cutting board. Culinary knives should be sharpened two to three times a year to restore the blades’ original contour and angle. Whether you choose to hone at home or let the pros handle your steel, sharp knives are a must for every cook. Regardless of how you choose to sharpen your knives, a sharpening steel is essential for your home kitchen. Use this thin, steel rod as often as you like to keep a knife’s edge aligned between sharpening. I think of it as a tune-up and run my blade over the steel a few times before any major chopping endeavor and especially before and after more arduous tasks like splitting a squash or trimming meat. 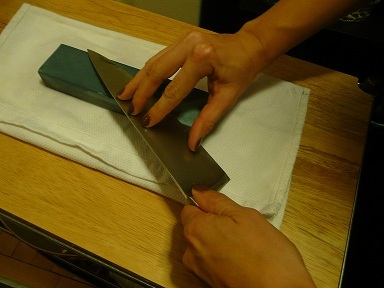 A sharpening steel will not improve the quality of dull knives. Steeling takes a bit of technique, too, but an improper slide on the steel isn’t likely to cause irreparable damage. How to: Holding the steel in one hand and the knife in the other, sweep the blade, from base to tip, down the length of the steel at a 20-degree angle. Repeat motion five to six times on each side. Whetstone: For purists and those who like a little project, learning how to sharpen on a whetstone is efficient and great fun. I can’t help but channel Uma Thurman in Kill Bill each time I unsheathe my 10-inch Shun and run the glinting blade across the stone. And if anyone is lucky enough to come upon me during this ritual, I greet them by brandishing my culinary weapon and whispering reverently, “It’s an Hattori Hanzo.” I love the tradition, skill and ceremony of sharpening my tools the old fashioned way. But I still curse the chaffing my first Wusthof took as I learned the technique, so practice on lesser knives and only use the fine side of the stone (as opposed to the coarse side – think nail file for your knives) as it offers plenty sharpening power for dull knives. Submerge whetstone in water for at least 1 hour before sharpening. Place stone on a damp kitchen towel, fine side up, to keep it from sliding. Douse the stone with some fresh water. With one hand, hold the knife by its handle placing the blade, point-first, against the stone with the cutting edge hitting the stone at a 22-degree angle. Stabilizing the blade with your free hand, slide the blade forward and across the stone the entire length of the blade, maintaining a 22-degree angle. Repeat seven to ten times, wetting stone often. Flip knife and repeat the same number of strokes on the second side. Wipe knife dry and finish on a steel. Do not sharpen serrated knives on stone. Have them done professionally or use an electric sharpener with a serrated setting. Purchase a knife-sharpening guide. The most important part of proper sharpening is the angle of the knife. This inexpensive tool guarantees that your knife is being held at the right angle. To test the sharpness of a knife, try cutting a ripe tomato. A finely honed blade will slice easily through the fruit’s skin without crushing its soft flesh. Manual and Electric – Most manual sharpeners do a decent job, but if you can invest in a good electric sharpener, it will pay off. I may be a traditionalist, but I must admit that the Chef’s Choice electric sharpener that I received for Christmas a few years back has seen some serious action. It’s clean, fast and there’s no guesswork. Leave it to the Pros – Knife sharpening service is available at select True Value locations throughout the country. Or, inquire at your local hardware store. At about $5 a knife, professional sharpening is an inexpensive way to extend the life and performance of your most essential culinary tools. Take your freshly sharpened blade for a test drive with this chop-heavy fresh salsa. Combine the chopped ingredients in a medium bowl and toss with the lime and tomato juices. Season to taste with salt, pepper and Tabasco. Chill, then pulse in blender until slightly chunky and serve as a gazpacho with a dollop of sour cream. When baking or grilling fish wrapped in parchment, spoon salsa over top of fillets before sealing the packet.